"Luke Skywalker has vanished. In his absence, the sinister FIRST ORDER has risen from the ashes of the Empire and will not rest until Skywalker, the last Jedi, has been destroyed. With the support of the REPUBLIC, General Leia Organa leads a brave RESISTANCE. She is desperate to find her brother Luke and gain his help in restoring peace and justice to the galaxy. Leia has sent her most daring pilot on a secret mission to Jakku, where an old ally has discovered a clue to Luke's whereabouts..."
The setting was thirty years after the Battle of Endor and the defeat of the Galactic Empire, portrayed in Episode VI - Return of the Jedi. The galaxy was still at war, pitting the New Republic (and its Resistance fighters and Starfighter pilots, led by Luke Skywalker's twin sister, General Leia Organa (Carrie Fisher), the ex-Princess) against the villainous forces of the First Order, successors of the Galactic Empire, fortified by Stormtroopers. On the sandy desert planet of Jakku (in the village of Tuanul) where he had been sent on a secret mission, Starfighter pilot Poe Dameron (Oscar Isaac) (and his rolling, orange and white droid-robot astromech BB-8) met with village elder Lor San Tekka (Max von Sydow), who had witnessed the long years of Clone Wars. Dameron had been sent there by General Leia to help locate and save the last Jedi, her twin brother Luke Skywalker, from the evil First Order. Elder Lor San Tekka possessed a star-map that might help the Resistance locate him. Poe was trailed by First Order Stormtroopers, who assaulted the village. It was impossible for Poe to flee when his X-wing Starfighter's engines were damaged, so he hid the star-map with the droid, who was instructed to deliver it to General Leia. A large command shuttlecraft from a massive orbiting Star Destroyer (The Finalizer) also landed, carrying evil, dark-hooded Kylo Ren (Adam Driver), who wielded a fiery-red plasma, cross-guarded lightsaber, and was aided by chrome-plated, metallic-armored female Captain Phasma (Gwendoline Christie). The First Order Stormtroopers massacred the villagers with their blasters and completely decimated the settlement. Also, Tekka was murdered by Ren's lightsaber, and Poe who vainly attempted to resist, was captured (to later be tortured with a mind-probe to extract information about the map). One of the Stormtroopers, reluctantly not firing his blaster during the massacre, was FN-2187 (John Boyega), who would soon turn his back on the Dark Side, help Poe escape, and join the Resistance. In the next unrelated sequence but also on the planet of Jakku, young, orphaned female scavenger Rey (Daisy Ridley) was introduced inside a downed Star Destroyer. She was opportunistically collecting the metallic wreckage of many years of war. After taking her Speeder across the desert flats, Rey traded her scrap wares for dried foodstuffs at the local Niima Outpost with unscrupulous Unkar Plutt (Simon Pegg), a male aquatic Crolute. When she returned to her home (the decrepit insides of a crashed four-legged transport AT-AT), she was able to rescue and free BB-8 from green-skinned, scavenging desert creature Teedo (Kiran Shah) riding a semi-mechanical Luggabeast. Imprisoned Poe Dameron was tortured by Kylo Ren, whose Mind Probe Force extracted the location of the map (within a BB-8 droid on Jakku). Kylo Ren notified young and ruthless General Armitage Hux (Domhnall Gleeson) of the High Command of his findings. Traitorous defector FN-2187 - after changing allegiances, aided Poe in his escape from the Star Destroyer in a stolen TIE fighter. During their flight, Poe decided to shorten the Stormtrooper's name to Finn. Their TIE fighter was shot at by the Star Destroyer's ventral cannons, causing it to crash-land on the planet Jakku (both ejected safely although to separate locations, as Finn presumed that Poe had perished), while a massive search by the First Order immediately began for the escapees and for the droid. Finn (posing as a Resistance pilot wearing Poe's jacket) encountered Rey and BB-8 at the Niima Outpost marketplace, where thugs sent from Unkar Plutt unsuccessfully attempted to abduct BB-8 from her after she had refused to sell it. The two (and the droid) were forced to flee from pursuing Stormtroopers and blasts from two TIE fighters. They escaped in the rusted, weathered and old freighter ship the Millennium Falcon (owned by Unkar Plutt), piloted by Rey. After destroying the TIE fighters, they escaped into space and soon found themselves drawn by a tractor beam and swallowed within another massive freighter - the pirate ship Eravana. They were boarded by notorious ex-General and smuggler Han Solo (Harrison Ford) and his Wookiee co-pilot Chewbacca (Peter Mayhew), who exclaimed as former owners of the MF: "Chewie, we're home!" Rey's and Finn's mission to get BB-8 back to Resistance (with the map to Luke's location) was delayed when the Eravana was boarded by two criminal gangs who demanded money from Han: (1) the red-armored Guavian Death Gang led by Bala-Tik (Brian Vernel), and (2) the Kanjiklub gang led by outer-rim, street-fighting thug Tasu Leech (Yayan Ruhian). Fortuitously, Rey and Finn accidentally released the ship's cargo by opening container doors, unleashing three giant tentacled Rathtars with sharp teeth that attacked the gang members, allowing the group to flee in the Falcon and speed away into hyperspace. At a hidden base, the First Order forces were consolidating their military might, in violation of treaty restrictions of the Galaxy. General Hux and Kylo Ren took orders from the First Order's Supreme Leader Lord Snoke (Andy Serkis) via hologram and seated on a throne. The angry Snoke revealed to his apprentice Ren that the astromech droid containing the map leading to Skywalker was on the Millennium Falcon. He also stated that Ren's father was Han Solo (Ren loyally replied: "He means nothing to me"). Later in solitude in his meditation chamber, the Vader-obsessed villain Ren revealed that he was allied with his Sith Lord grandfather Darth Vader (represented by his burned helmet), and entreated to be pulled back further toward the Force's Dark Side ("Forgive me. I feel it again, the pull to the light. Supreme Leader senses it. Show me again, the power of the Darkness, and I will let nothing stand in our way. Show me, Grandfather, and I will finish what you started"). During the Falcon's journey, Han explained to Rey and Finn that Luke (who was training a new generation of Jedi) had disappeared (in self-imposed exile) after one of his apprentices turned to the Dark Side and became Kylo Ren, destroying all that Luke had built (as a result, "Luke felt responsible. He just walked away from everything"). Rumors included the possibility that Luke was searching for the first Jedi temple. The Millennium Falcon set course for the green and blue planet of Takodana, to meet up with Han's old friend, dimunitive ancient pirate Maz Kanata (Lupita Nyong'o), so that they could trade it for a clean, untraceable ship ("to get your droid on a clean ship"). At her pirate's castle and "watering hole" cantina filled with unsavory scoundrels and ruffians, they met up with Maz. Representative spies from both sides of the conflict informed their contacts that the droid had just arrived there. Maz sensed that Finn sought to retreat and seek adventure elsewhere, and this was confirmed when he told Rey ("I'm not Resistance, I'm not a hero. I'm a stormtrooper"), and vowed never to go back. Indeed, he proposed to sign up to be a crew member on the Crimson Corsair with first mate Quiggold to escape to the Outer Rim. Simultaneously, the Force called Rey, who was drawn to a relic in a wooden box found in a sub-chamber - the hilt of an old Jedi lightsaber - the one previously used by Luke and his father Anakin. After a terrifying vision of her own childhood, Maz appeared to Rey and explained her destiny to follow the Force: "That lightsaber was Luke's. And his father's before him. And now, it calls to you....The belonging you seek is not behind you - it is ahead. I am no Jedi, but I know the Force. It moves through and surrounds every living thing. Close your eyes. Feel it. The light, it's always been there. It will guide you." Confused about what to do, Rey ran off from the castle into the woods with BB-8. During a First Order rally at the Starkiller Base (a mobile ice planet), the maniacal General Hux ominously announced "the last day of the Republic' to a group of assembled Stormtroopers and associate commanders. Their new superweapon, dubbed Starkiller, was capable of directing the Sun's energy to decimate star systems. In a demonstration of lethal strength, the Starkiller's ray of fire destroyed the Republic-controlled Hosnian star system and its main planet, Hosnian Prime. The devastation was visible in the sky from Takodana. The pursuing forces of the First Order commenced their attack on Takodana, with dispatched TIE fighters, assault landers and troops, and Kylo Ren in command in a V-wing shuttle. As the destructive assault on Maz's castle began, Finn reconsidered his departure, and accepted Maz's offer of Luke's old lightsaber to help defend the group. In the woods, Rey also used a blaster to fight off pursuing Stormtroopers. Eventually after a stiff defense, Finn, Han, and Chewbacca were disarmed and taken into custody. Suddenly, Resistance group troops and X-Wing fighters approached in a successful counter-attack, led by Poe Dameron (who had survived the crash on the planet of Jakku), and the First Order was sent into retreat. However, nearby in the woods, Rey was relentlessly pursued by Kylo Ren with his light-saber, rendered unconscious, abducted and taken away in his departing V-wing shuttle. A Resistance transport landed, carrying General Leia and C-3PO. During a brief reunion scene, Han grimly told Leia about seeing Kylo Ren: "I saw him. Leia, I saw our son. He was here." The Resistance fighters and the Millennium Falcon (carrying Maz, Chewie, Han, Finn, and BB-8) regrouped at a subterranean base on the mottled green planet of D'Qar (surrounded by icy asteroid belt rings). The map in BB-8's memory banks, according to C-3PO, was incomplete and didn't match any known charted system. Leia and Han spoke about their son's decision to embrace the Dark Side, leading to their own separation. She blamed Supreme Leader Lord Snoke but still held out hope: "He seduced our son to the Dark Side. But we can still save him...There is still light in him, I know it." While imprisoned at the Starkiller Base, Rey was tortured and questioned by Kylo Ren, who removed his mask for the first time. He used his mind-probe powers on her, but she resisted and fought back ("I'm not giving you anything"). After combating his mental powers with her own burgeoning Force powers, she told him that she sensed fear in him: ("You're afraid that you will never be as strong as Darth Vader"). When he departed to confer with Snoke, she was able to escape her cell with a Jedi mind trick played on a Stormtrooper guard. Ren's discovery of her escape angered him and he went into a fit of rage. At the Resistance base, the fighters were debriefed as they prepared for a counter-offensive assault against the Starkiller Base and its superweapon, which had begun to drain the power of the sun for charging, so that it could destroy D'Qar. Leia warned everyone: "Our system is the next target." The Resistance's strategy was to blow up the thermal oscillator (in Precinct 47) that enabled the charging process to occur. If obliterated, it would "destabilize the core and cripple the weapon." Poe vowed to lead an assault of X-wing fighters to attack and disable the Starkiller Base's shield emitters, so that they could blow up their "big gun." The assault of the Starkiller Base commenced with the Millennium Falcon crash-landing on the snowy and icy Starkiller Base planet. Han, Chewie, and Finn infiltrated the main control-room headquarters, captured Captain Phasma, and forced her to lower and disable the shield emitters before disposing of her down a garbage chute. Poe and his X-Wing fighters were given the go-ahead to attack their target (the hexagonal-shaped oscillator). The heroes' continued approach to the weapon power station to set thermal detonators in the base's power station luckily included a surprise reunion with Rey in a Base hallway. However, due to stiff defenses put up by the Starkiller Base and the First Order's TIE fighters, the Resistance forces seemed doomed. Kylo Ren and his father Han confronted each other at distant ends of a narrow catwalk bridge within the base. Han addressed Kylo with his original name ("Ben" Solo), and asked his son to remove his mask. Kylo replied: "Your son is gone. He was weak and foolish like his father, so I destroyed him." Han blamed the Supreme Leader: "Snoke is using you for your power." When they were face-to-face, Han said it wasn't "too late," and pleaded with his fallen Jedi son to "come home" and abandon the Dark Side. Ren briefly surrendered his red light-saber to Han, but then resisted, ignited the saber, and thrust it through Han's torso. After being stabbed to death, Han stroked his son's face, then fell into an abyss from the catwalk. At the same time, the power station explosives were detonated by Chewie, and a blaster fire-fight began between the surviving heroes and Ren (who was wounded). He chased Rey and Finn outside the Base as they fled into the woods toward the Falcon. When they came face-to-face, Ren knocked Rey unconscious, and then faced the traitorous Finn wielding Luke's blue lightsaber - the duel ended with the defeated Finn suffering major injuries. Regaining consciousness, Rey resumed the fight against Kylo with the same light-saber, channeling the Force within her. Kylo suffered multiple wounds, was severely injured and fell back on the snow as a collapsing sink-hole separated him from Rey - he suffered an unknown fate. Chewie activated the Falcon and rescued both Rey and the seriously-injured Finn. In the air-war between the TIE fighters and the dwindling number of Resistance pilots, and with only 30 seconds remaining before the superweapon was fully charged, one remaining X-Wing fighter (piloted by Poe) released its payload in the trench at the Starkiller's oscillator, triggering other explosions that obliterated the entire base. In a panic, General Hux reported to Lord Snoke that the base had been massively damaged ("the collapse of the planet has begun"), and they immediately evacuated and abandoned the installation (hoping to locate Ren). Back at the Resistance base at D'Qar where everyone was reunited, the heroes celebrated a mixed victory - the First Order base was destroyed, but Han was dead, and Finn was seriously injured and unconscious. Dormant droid R2-D2 suddenly awakened and revealed the remaining section of the holographic map to Luke's hidden location that matched up with BB-8's fragment - the completed map pointed to a water-covered planet known as Ahch-To. In the concluding scene set on a remote, craggy island in an unknown world, Rey (accompanied by Chewbacca and R2-D2) had flown there in the Falcon, hoping to locate Luke. After an arduous trek up a steep path of stone steps to the summit, a cloaked and hooded figure was found standing with his back to her. The bearded figure slowly turned towards her, removed his hood (with both hands - his right hand was mechanical) and revealed himself to be Luke Skywalker (Mark Hamill). She extended his light-saber to him with her left hand - frozen in a standstill, as the film concluded. The release of the 7th Star Wars franchise film was monumental, since it had been 10 years since the last installment-episode of the wildly-successful, fan-favorite series, Star Wars: Episode III - Revenge of the Sith (2005). 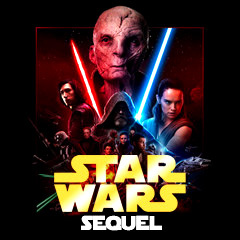 This was the first part of a sequel trilogy of Star Wars (Episodes VII, VIII and IX) and the seventh film in terms of chronology (it was the chronological sequel to Star Wars: Episode VI - Return of the Jedi (1983), released 32 years earlier). Remarkably, it was the first of the Star Wars films without series creator George Lucas' involvement, and the first film to be released following Disney's 2012 acquisition of LucasFilm. Many box-office records were broken almost immediately. The newest addition was the first in a new trilogy, teaming up the older generation of Rebel heroes with a new generation of freedom-fighting Resistance heroes - to continue their fight against oppressive, militaristic, and tyrannical forces of the First Order. With the tagline: "Every generation has a story." This was the second Star Wars film to be released in IMAX, and the first to be released in IMAX 3D. Every other live-action Star Wars film was released in May, except for this one, released in December. Nominated for five Academy Awards (with no wins): Best Film Editing, Best Original Score (John Williams), Best Sound Mixing, Best Sound Editing, Best Visual Effects. With a production budget of $245 million, and box-office gross receipts of $936.7 million (domestic), and $2.068 billion (worldwide). It was the highest-grossing (domestic) film of 2015, besting second place Jurassic World (2015) at $652.3 million. At the time, the film had the highest-opening weekend of all time, at $248 million. To date (2018), the film remains the highest-grossing (domestic) film of all-time, if unadjusted for inflation.